Everybody remember Kazoku Game and its shocking depiction of the malicious extents to which young teenagers (I'm talking like middle schoolers) can go to inflict pain and humiliation upon their peers? Perhaps the scenes in the drama were representative of the more extreme and violent forms of bullying, but there is no doubt that even if the bullying that occurs in most schools is not half as dramatic as Kazoku Game, it still leaves a powerful and lasting psychological wound on its victims, subjecting them to the torment of low self-esteem, social ostracization, depression, and in worst cases, suicidal tendencies. Sho and Nino reading thank you letters from victims of bullying. On the 2006.12.11 episode of News Zero, of which our beloved Sakurai Sho is a newscaster for, the program talked about how they had received lots of letters from victims of bullying on their homepage (I think they were doing some sort of special discussion about this topic at the time). Many of these letters were addressed to Arashi and talked about how Arashi's songs had given the writers strength to face life. One girl who was so afraid of her bullies that she developed a fear of going to school said that the lyrics "Dareka ga dareka wo sasaete ikite irun da" from Arashi's song Kansha Kangeki Ame Arashi really gave her the courage to step into her classroom again. Other letters which were handed out personally to the five Arashi members spoke of how Arashi's music and their example encouraged victims of bullying to face their tormentors and some even said that Arashi saved them from suicide. Sho and Jun both said a few words about their feelings after reading such heartfelt and meaningful thank-you letters. They were basically saying that it's gratifying to know that Arashi's music can have such a positive effect on other people's lives and that it can really help people in their darkest hours. 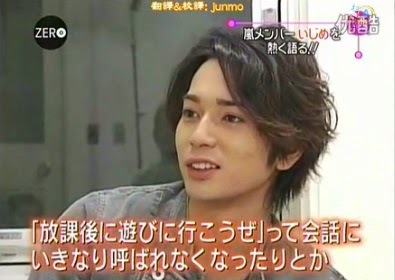 Jun said that it made their activities as Arashi meaningful. Both of them sounded very solemn and subdued as they spoke, like they were quite humbled to realize the sheer power of their work. Aiba mumbled a "It's great that we recorded all those songs" in a very low tone, and his tension was at an un-Aiba-like low level, too. I think our Aibaby was definitely feeling humbled and awkward and had no clue what to say when met with the great impact Arashi has had on some unknown stranger's life. Aiba: "It's great that we recorded all those songs." And then, the Arashi members were asked to reveal if they had ever had any experiences of being bullied. MatsuJun raised a hand, and said he had. Ohno asks him how he was bullied and Jun says that he'd gotten the cold shoulder treatment from a classmate before. Apparently, there was a boy who he used to play with afterschool, but then one day, that boy just stopped inviting him over to play, and I guess Jun felt rather hurt by that. To be honest, I think such a thing has probably happened to a lot of us before; it's not necessarily bullying. My personal guess is that there was probably some misunderstanding and bad communication between Jun and his friend and they just fell out of favor with each other. It happens. Friendships can end for very frivolous reasons, after all. 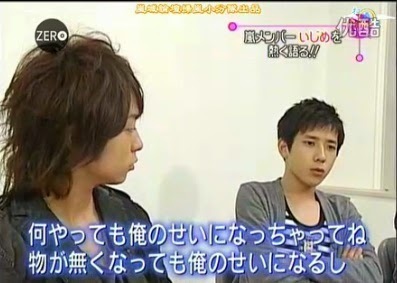 But anyways, Jun was clearly a bit hurt by this unexplained cold shoulder if he still remembered it in 2006. Jun talking about being ignored by his playmate. Then, we go on to Nino, who has (I feel) been bullied in a much more serious kind of way. I'm guessing there was a lot of targeting and singling out done in his case, probably lots of name-calling or outright humiliation too, because what Nino said, even though he used very vague terms, sounded like it came straight from his heart, like he was actually peeling at an old wound in revealing these feelings on TV. Nino talking about his experience with bullies. 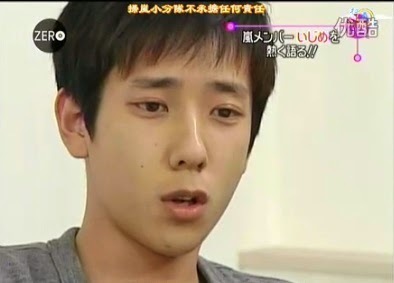 Nino says that he's been bullied before, so he absolutely can sympathize with what it feels like. "It's like no matter what happened, it'd be my fault. When something went missing, it'd be my fault. When anything went missing, it'd all be my fault." The way Nino looked and the way he sounded just made my heart go right out to him. Poor Nino! He must have felt so helpless! Sho then goes on to ask him how he dealt with his bullies, but the answer Nino gave struck me as a rather bleak one. Nino said that in the end, nothing really changed but the target of the bullying. When they were done with him, his tormentors would simply move on to the next poor guy, and the bullying would continue. "If it wasn't me, it'd be B-kun," said Nino, in an effort to clarify. "So in the end, to me, the feeling of being bullied remained." It was like there was no end to the bullying, and there was also nothing poor Nino could do about it. That sense of powerlessness that young Nino felt was very evident on his face in this interview, and really made me feel both sad that such viciousness could exist within middle-school-aged minds but also glad that Nino was able to grow into the happy fulfilling life he currently leads, with lots of love and support from Arashi and other people, too I'm sure. So aside from presenting you all with so many screencaps of Nino's sorrowful expressions, I do think that it is worth posting about moments like this when Arashi are stepping up to relay a very powerful and meaningful message out to the general public. As idols, as popular figures, they do command a great deal of influence, even if they themselves are too humble to grasp it fully. And I'm just really glad that they stood forth, especially Nino, to condemn bullying and to show everyone who has to live with bullies that being bullied and humiliated is not the end of the world. It is still possible to stand up after being beaten down, and to be strong and grow up to be successful and happy once you leave behind the shadows of your bullies. Always hold your head high, Nino! And to everyone else in the world who need to hear it: don't let the shallow, hurtful words of others get you down! In this day and age, even in as happy a place as fandom, I see signs of cyber-bullying and it just makes me sad, because sometimes, a faceless bully hiding behind the mask of the internet can be even scarier and more hurtful than a real tangible bully. So I'd just like everyone to remember that words are, in the end, just words, and to take the different opinions on the internet (some of which are expressed in very incendiary terms) with a grain of salt. Don't let the bullies, any form of bully, get you down!